I am officially on the El Camino De Santiago trail in Spain! We started out in Fatima, Portugal, traveled to Porto and Gaia Portugal, and have now walked from Tui to Porrino, Spain! Thank you to everyone who sent in their prayer intentions. I didn’t have a chance to reply to your messages, but know that I wrote every single one of them down in my journal and I am taking them on my journey! So I’ve been having fun making video diaries so that you can travel along with me! So far I’ve made three, and I’m desperately trying to get the fourth one up from today, but the hotel’s wifi is pretty sketch city, so who knows if it’ll be up by then! But here are the three that are up so far! Porto, Portugal and Tui, Spain! Hopefully I’ll be able to get tonight’s up before the post goes live! I did! Here is the latest video! 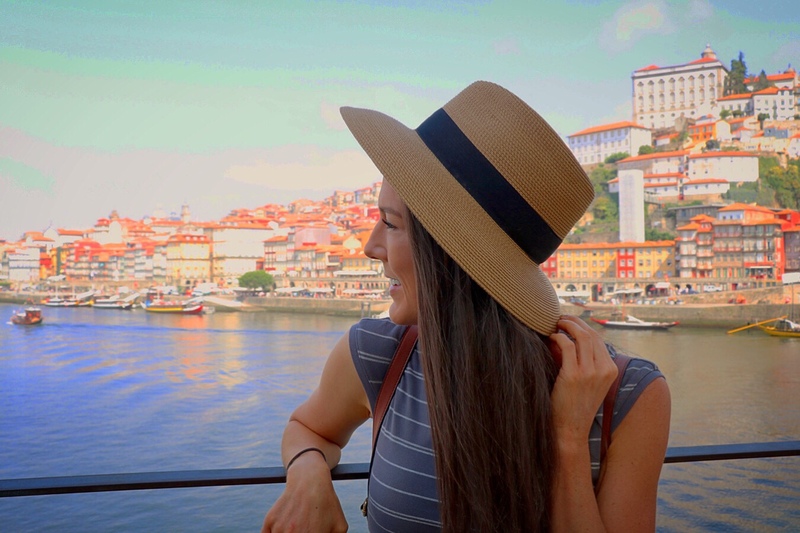 Thanks for following along my journey along the Camino! God bless and buen Camino! Really awesome! Continued to be blessed! I hope that you have a great journey. I love the pictures. You are very graciously welcome Gorgeous Beyond Bones. Hugs and love to YOU!!! It is nice to see you having fun. P.S. You have a cute face. Seeing you enjoying these travels, you seem to be having a wonderful time. That part of Europe looks very pretty! Have a great time in South-Europe, my dear friend together with your mom. I am happy that she is better now. Here in Finland, I take care of an old man who suffered 3 times from a brain stroke and each time he managed with discipline and positivity to move his legs and arms and to speak again. Of course it takes a while but there is always hope. I did The Camino last year from St Jean to Santiago…it was an amazing journey and the real journey begins when you get home…Buen Camino! I’m really enjoying “meeting” Mrs. BBB! More of her!!! Thank you for making the effort to share your trip with us. Might I suggest a daily summary? Just a short breather/reflection of the day. All the “live” as-you-go shots are fun, but I’ll bet a daily reflection at day’s end will help you personally as well as share the benefits of your sojourn with your readers. Just a thought. Continued prayers for your safety! I’m just glad you’re having a rewarding time…especially with Mrs. BBB! Summaries is just a suggestion; I understand how full the time gets! Maybe a reflection on the whole thing after you get home and can breathe! Again, just a suggestion, but you might find value in it yourself to record your thoughts at the time for your future self. Prayers & hugs! I remember my wife cycling this back in 2009 . She said it was one of the best experiences of her life. Loved your videos, they were all so fun!! And your mom is such a cutie too. I hope you’re enjoying Spain and also having time to pray and reflect while you walk the Camino. Oh and by the way, I think you’re really going to like “How to find your soulmate without losing your soul”, it taught me a lot! Hello! I just wanted to write and let you know your blog title inspired me to write a poem. My apologies for sharing the link here. I couldn’t private message it to you like I wanted. Anyways, enjoy your trip! Safe travels to you! So glad to see you’re having a fabulous adventure so far! I had the opportunity to explore Barcelona and Madrid in the summer of 2005 with 40 of my high school classmates, teachers, and a few parents. It was a blast! As you walk across Spain, in the present day of both the review of priest and police conduct, near the homeland of my favorite saint from Loyola, you should read the book, “Spain In Our Hearts.” The Spanish Civil War is still alive, much like the Spirit of Saint James in Spain. Franco was a fascist who allied his side in political struggle with the Catholic Church, against the threat of Communism as well as the secular world. Did you know that The Inquisition in Spain that began when Christopher Columbus set forth for America, ended in 1968? There had been 2000 churches destroyed in their Civil War. Can you imagine sitting in a church and fearing violence? Seven thousand priests were killed in the Civil War in Spain, as democracy took over, from monarchy. And then there were all these holes. Pedro Arrupe was this Jesuit Superior who once asked a Jesuit seminarian why he had to go to India to find the poor, on matters of spiritual direction? To be humbled, more? In the land where three religions worship the same God discovered by Abraham, why do those who so deeply respect human dignity so often turn on each other? To identify our crimes and pronounce our sins? To not allow anyone to be above the law. Lol, I’ve seen you guys have been having a good time thus far! The place looks great. Enjoyed the read! The trip sound wonderful! Reminded me of the four years my family and I lived in Spain! Beautiful pictures, and I enjoyed the tour through Portugal and Spain! What a blessing for you and your mom! Take care, God bless, and I look forward to subsequent posts on your journey! How awesome is God! I was just watching a documentary on 12 menwho set out on that trail! I had asked if there was anything particular that day on Netflix, and he led me to something called Footprints. Now today I am asking the Lord which blog do you want me to catch up on first! He sent me to you, dearest Caralyn! I’m not able to watch the videos where I am now, but I am excited and eager for when I am home later! Praying for you and your mom. It is the most wonderfully thing to seek God, and to follow Him… No matter what! God loves you and your mom! Thanks for taking us on a little portion of your journey. Thanking you for sharing all your anecdotes, recounts and wonderful stories. It’s been a real pleasure Caralyn I have loved hearing the church bells and the pink butterflies around you both. God bless and may God grant you the desires of your hearts.